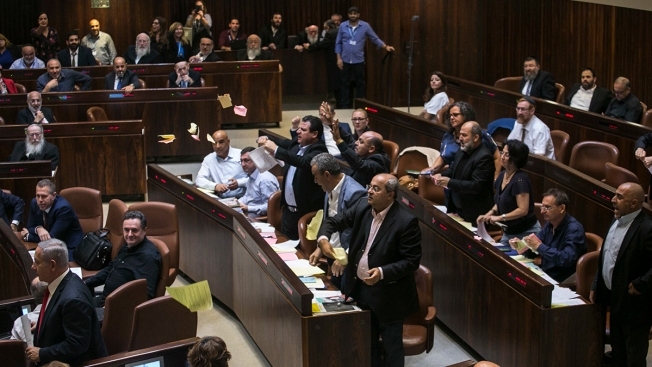 The American Jewish Committee said the law "put at risk the commitment of Israel's founders to build a country that is both Jewish and democratic"
Arab lawmakers stand up in protest during a Knesset session in Jerusalem, Thursday, July 19, 2018. Israel's parliament approved a controversial piece of legislation on Thursday that defines the country as the nation-state of the Jewish people but which critics warn sidelines minorities. Israel’s “nation-state” law that was celebrated as a “defining moment” for the country by its supporters has prompted forceful protests inside the country and around the world, NBC News reported. The law that narrowly passed early Thursday declaring only Jews have the right of self-determination was backed by Prime Minister Benjamin Netanyahu’s right-wing government. Netanyahu said the law was "a defining moment in the annals of Zionism and the history of the state of Israel." But the American Jewish Committee, one of the oldest and most prominent Jewish advocacy groups, said it was "deeply disappointed" by the law, and added it "put at risk the commitment of Israel's founders to build a country that is both Jewish and democratic."